NATO and Afghanistan signed an agreement in Lisbon marking the Atlantic alliance's commitment to the war-torn nation after it ends combat operations, ostensibly by the end of 2014. But a senior U.S. official said some combat troops would stay on beyond that deadline. At a press conference flanked by Afghan President Hamid Karzai and United Nations Secretary-General Ban Ki-moon, NATO Secretary-General Anders Fogh Rasmussen said NATO would not abandon Afghanistan - or the region - even after its forces leave. 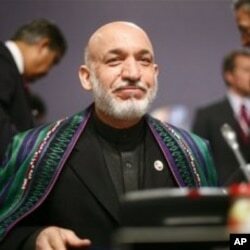 He spoke minutes after signing an agreement with Mr. Karzai ensuring NATO's long-term presence in that country. "The long-term partnership agreement we have signed today is not only a signal to the Afghan people that we stay committed beyond the date when the combat mission ends. It is also a clear signal to the region that we will not leave behind a security vacuum that could create instability in the region," he said. Mr. Rasmussen's remarks came as NATO's 28 member states formally agreed to start reducing troop levels in Afghanistan next year and to hand over full control of security operations to Afghan forces by the end of 2014. Mr. Rasmussen said he was confident that deadline could be met, because he said NATO forces were making progress in attacking the Taliban insurgency. But a senior U.S. official said not all combat troops would be out of Afghanistan by that date, noting there was still a lot of hard fighting going on. And both Mr. Rasmussen and U.N. chief Ban cautioned that NATO's actions must reflect the realities on the ground. "Basically I believe that the transition is not about the dates, it is about the status of health Afghanistan can take their leadership, can take ownership to promote their own stability and peace," said Ban. The remarks follow criticism by Mr. Karzai of U.S. military operations in Afghanistan, notably night raids against insurgents. But on Saturday, the Afghan president said NATO leaders had understood his concerns. "Generaly I found the environment today one of satisfaction and of confidence towards a partnership that will bring us success in our endeavors," he said. Besides talks on Afghanistan, NATO heads of state have also endorsed a new roadmap or stategic doctrine for the alliance based on the premise that an attack on one member is an attack against all. NATO leaders are also holding talks with Russia on Saturday along with separate U.S.-European discussions.